Objective To examine how change in level of physical activity after middle age influences mortality and to compare it with the effect of smoking cessation. Design Population based cohort study with follow-up over 35 years. Setting Municipality of Uppsala, Sweden. Participants 2205 men aged 50 in 1970-3 who were re-examined at ages 60, 70, 77, and 82 years. Main outcome measure Total (all cause) mortality. Results The absolute mortality rate was 27.1, 23.6, and 18.4 per 1000 person years in the groups with low, medium, and high physical activity, respectively. The relative rate reduction attributable to high physical activity was 32% for low and 22% for medium physical activity. Men who increased their physical activity level between the ages of 50 and 60 continued to have a higher mortality rate during the first five years of follow-up (adjusted hazard ratio 2.64, 95% confidence interval 1.32 to 5.27, compared with unchanged high physical activity). After 10 years of follow-up their increased physical activity was associated with reduced mortality to the level of men with unchanged high physical activity (1.10, 0.87 to 1.38). The reduction in mortality associated with increased physical activity (0.51, 0.26 to 0.97, compared with unchanged low physical activity) was similar to that associated with smoking cessation (0.64, 0.53 to 0.78, compared with continued smoking). Conclusions Increased physical activity in middle age is eventually followed by a reduction in mortality to the same level as seen among men with constantly high physical activity. This reduction is comparable with that associated with smoking cessation. Despite the known hazards of physical inactivity, it continues to be a major health problem.1 Physical inactivity is associated with increased incidence rates of obesity, diabetes, cardiovascular diseases, osteoporosis, and cancer.1 2 3 4 Short term randomised controlled trials in young to middle aged adults have shown a healthier risk profile with exercise.4 5 It is therefore recommended that adults engage in at least 30 minutes of moderate physical activity preferably on all days of the week.5 6 7 Adherence to these guidelines is associated with half the risk of mortality seen in sedentary people.8 Nevertheless, about half of all middle aged men in the West do not take part in regular physical activity.1 2 Whereas being physically inactive in younger years seems detrimental, we do not know whether an increase in exercise level later in life reduces mortality rates. If the impact on mortality could be compared with the effects of other changes in lifestyle habits it would be easier to communicate this potential health benefit. In prospective studies that have examined changes in leisure time physical activity level in relation to mortality,9 10 11 12 13 14 15 few have considered the possibility of additional changes in physical activity behaviours during follow-up.13 14 15 Furthermore, the impact on mortality in relation to age at the time of the activity changes and the time elapsed since the changes occurred have not been established. We investigated the impact of physical activity on total (all cause) mortality from middle to old age, taking into account changes in activity during follow-up. We studied this in a population based cohort of men aged 50 at baseline who were followed up for more than 35 years and investigated on five occasions. We also compared the effect of an increased level of physical activity on the mortality rate with that achieved by cessation of smoking. The present investigation used data from the population based Uppsala longitudinal study of adult men (ULSAM, www.pubcare.uu.se/ULSAM). Figure 1 shows the study population ⇓. 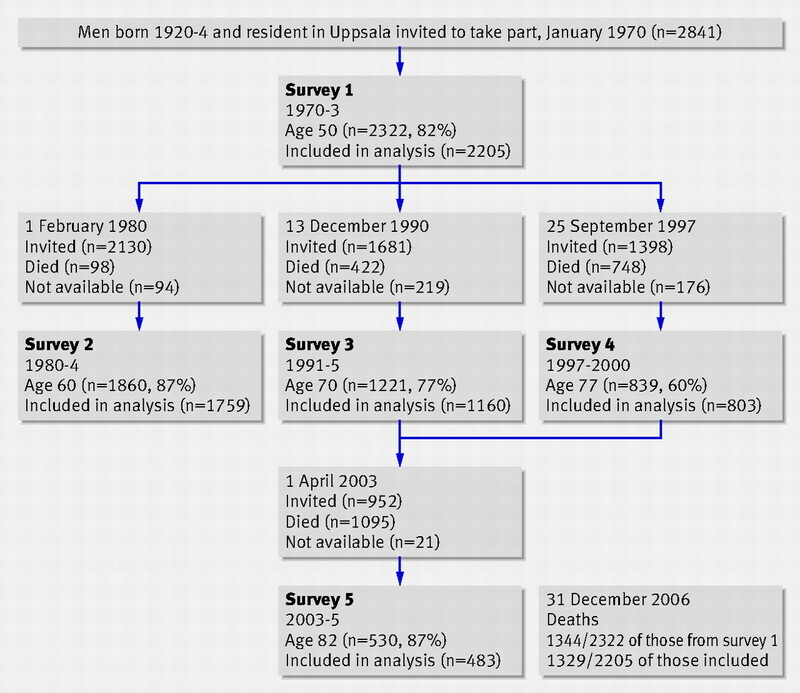 In 1970 all 2841 men born in 1920-4 and living in the municipality of Uppsala, Sweden, were invited to attend a health survey (survey 1).16 Of those invited, 2322 men (82%) aged 49-51 participated. Participants in survey 1 were invited for reinvestigations at ages 60, 70, and 77 (surveys 2-4). Participants in surveys 3 and 4 were invited for reinvestigation at age 82 (survey 5). 1 Do you spend most of your time reading, watching TV, going to the cinema, or engaging in other, mostly sedentary activities? 2 Do you often go walking or cycling for pleasure? 3 Do you engage in any active recreational sports or heavy gardening at least 3 hours every week? 4 Do you regularly engage in hard physical training or competitive sport? Changes in the physical activity level between the first and second survey were considered in four categories: unchanged low (low or medium activity at both surveys), unchanged high (high activity at both surveys), decreased (high in survey 1, low or medium in survey 2), and increased (low or medium in survey 1, high in survey 2). Height and weight were measured at each survey and body mass index (BMI, weight (kg)/height (m)2) calculated. Obesity was defined as BMI ≥30. Systolic and diastolic blood pressure in the supine position was measured by standard procedures. Information on antihypertensive medication was retrieved by questionnaire, as was information on smoking habits. Smoking status was categorised as current smoker, former smoker, or never smoker. Changes in smoking status between two surveys were categorised as continued smoking, smoking cessation, and never smoking. Total fasting serum cholesterol concentration was measured with enzymatic techniques. The presence or absence of diabetes mellitus was determined at each survey according to the guidelines current at that time. Information on perceived health (classified as not good or good) and alcohol use at surveys 2 and 4 (classified according to the Michigan alcoholism screening test as abstainer, normal, suspected alcohol dependence22) was retrieved from the questionnaires. The census from 1970 provided information on educational level. Socioeconomic group at survey 1 was interview based and categorised as low, medium, and high.23 By linkage to the national hospital discharge register, we collected information on any musculoskeletal, neurological, or psychiatric disorder. The prevalence of each of these disorders and of diabetes was <1.2% at baseline. Using the individual 10 digit personal identification number given to all Swedish citizens,24 we traced the entire cohort in the continuously updated Swedish National Population Register until the date of death or 31 December 2006. Our main outcome was total (all cause) mortality. There was no loss to follow-up. The proportional hazards assumptions for the Cox models were confirmed formally by Shoenfeld’s tests, and graphically by comparing Nelson-Aalen plots. We considered one crude and two multivariable models. The first multivariable model included smoking status (current, former, never); weight and height (both continuous); self perceived health (good, not good); physical activity at work in 1970 and 1980 (sedentary, light, medium, high, unknown; or unemployed); alcohol use at ages 60 and 77 years (abstainer, normal, suspected alcohol dependence); and presence or absence of obesity, diabetes mellitus, and any musculoskeletal, neurological, or psychiatric disorder as covariates. The second multivariable model additionally included systolic and diastolic blood pressure, antihypertensive drugs, total serum cholesterol concentration, educational level, and socioeconomic group. Remaining life expectancy was calculated as the area under the survival curve using the trapezoidal rule approximation for the integral between the start of the study and the end of follow-up. We calculated differences in remaining life expectancy between exposure levels with 95% confidence intervals for the differences using the bootstrap centile method with 10 000 replications. In analyses of changes in physical activity level between the ages of 50 and 60, we partitioned follow-up time from date of examination in the second survey into five year intervals to account for non-proportional hazards. Statistical analyses were performed with Stata/SE 10.1 (StataCorp, College Station, TX), SAS 9.1 (SAS Institute, Cary, NC, USA), and R (R Foundation for Statistical Computing, Vienna, Austria, 2007). Table 2 shows baseline characteristics by level of physical activity at age 50.⇓ Almost half of the men reported a high level of physical activity, corresponding to at least three hours of recreational sports or heavy gardening a week, 36% reported medium activity, corresponding to walks and cycling; and 15% were sedentary. At the end of follow-up, we had 61 456 person years and 1329 men (60%) had died. The absolute mortality rate was 27.1, 23.6, and 18.4 per 1000 person years for men with low, medium, and high physical activity. The relative rate reduction attributable to high physical activity was 32% compared with low activity and 22% compared with medium activity. The relative mortality rates were highest among sedentary men and lowest among the most active men (table 3, fig 2)⇓ ⇓. This trend was also apparent in each category of smoking (not shown). The estimated effect of sedentary behaviour on mortality was similar to the effect of smoking and obesity (table 3).⇓ Adjustment for covariates attenuated the associations. We converted the differences in death rates into differences in remaining life expectancies from age 50. Men who reported high levels of physical activity were expected to live 3.8 (95% confidence interval 2.7 to 4.8) years longer than sedentary men and 1.8 (1.3 to 2.2) years longer than men who reported medium levels of physical activity. After adjustment for potential confounding variables the corresponding remaining life expectancies were 2.3 (1.3 to 3.3) and 1.1 (0.6 to 1.6) years, respectively. We investigated the influence on mortality of changes in physical activity between the ages of 50 and 60 in the 1759 men who participated in the first and second survey. From the date of examination in survey 2, we studied 34 020 person years and 998 men died. At the age of 60 about 27% (n=474) still reported high physical activity, 11% (n=194) had increased and 24% (n=414) had reduced levels, and 38% (n=677) reported unchanged low activity. Men who changed their physical activity level could not be distinguished from men with unchanged activity based on baseline clinical characteristics (not shown). 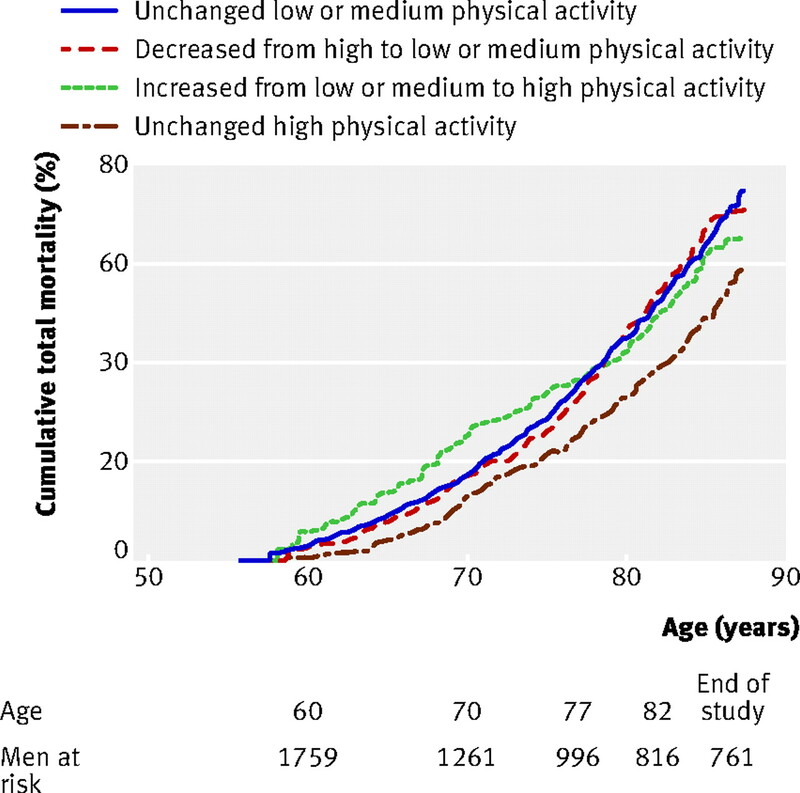 Changes in physical activity between the ages of 50 and 60 were associated with mortality (fig 3)⇓. After 10 years of follow-up the mortality rate did not differ between men who had increased their physical activity and men who were at an unchanged high level (table 4).⇓ This is also illustrated by the parallel failure curves after about age 70 (fig 3).⇓ During the first five years of follow-up, however, the mortality rate was 2.6 times higher in men who had increased their level of physical activity compared with men whose physical activity was high but unchanged (table 3).⇑ Adjustment for smoking, obesity, and other covariates attenuated the estimates but did not change the interpretation of the results. We studied men who increased their physical activity level in more detail. The mortality rate after more than 10 years of follow-up was halved in men who had increased their physical activity to a high level both from a medium (adjusted hazard ratio 0.58, 0.39 to 0.87) and a low (0.51, 0.26 to 0.97) level. There was no evident reduction in mortality rate among men who increased their physical activity from low to medium (0.81, 0.51 to 1.31). As a comparison, smoking cessation was associated with a 40% lower mortality rate after more than 10 years of follow-up compared with current smoking (0.64, 0.53 to 0.78). Men who had never smoked had a 60% lower mortality rate than current smokers (0.42, 0.33 to 0.52). There was no evidence of biological interaction between increased physical activity and smoking cessation in their effects on mortality; the relative excess risk due to interaction was −0.40 (−1.30 to 0.50). Increased levels of physical activity in middle age have an effect on mortality. After a 10 year period of increased physical activity the excess mortality seen in inactive men was reduced to the same levels of mortality as seen in physically active men. There is, however, a period of at least 5 years before this risk reduction during which the risk is higher. The halved mortality rate after 10 years of follow-up after increased physical activity between the ages of 50 and 60 (compared with continued inactivity) was similar to that seen after smoking cessation (compared with continued smoking). The main strengths of our study include the population based design, the long follow-up from a time before the men reached ages with a high mortality rate, the repeated measurements, and the objective and complete information on mortality. Our analyses also took into account changes over time in potential confounders including smoking, obesity, self perceived health, and morbidity and in classic risk factors for mortality including hypertension and total cholesterol concentration. We also adjusted our estimates for socioeconomic group and educational level. The main limitation of our study is its restriction to men and the crude assessment of physical activity by questionnaire, with risk of misclassification possibly leading to underestimation of the results.28 There is, however, no ideal test to measure physical activity,29 either by questionnaire or by more objective assessments. We used a questionnaire created in collaboration with the Swedish National Institute of Public Health that estimates physical activity over the life cycle.30 Although our categories indexing physical activity should be regarded as reflecting common perceptions or patterns of physical activity rather than precise measures of levels, the levels estimated from these four simple questions are positively associated with physiological measurements of fitness,16 17 skeletal muscle capillary density,31 and pedometer results,32 indicating that these levels do represent physical activity. Simple questionnaires are well suited for the study of changed behaviour in large epidemiological studies,28 and the repetition of identical questions at each survey is one of the main strengths of our study. The last observed value carried forward technique could introduce bias, despite being the preferred imputation method.33 As results from sensitivity analysis were consistent with the main results, it seems unlikely that this imputation method introduced bias. In our multivariable models, the adjustment for variables that can be regarded not only as confounders but also as intermediates on the causal pathway—such as perceived health, body weight, and diabetes—might also have conservatively biased our estimates. Many previous studies have used baseline data and changes in activity to examine whether physical activity influences mortality, without applying a time dependent approach in their analyses.9 10 11 12 34 35 Our associations between baseline data on physical activity and mortality rates were generally weaker than when we took into account changes within individuals in the level of physical activity during follow-up, further emphasising the importance of using time updated variables when behaviour such as physical activity is studied in relation to clinical outcomes.36 Time dependent life table analysis for estimation of remaining life expectancy among 50 year old men in the Framingham Heart Study showed 3.9-4.1 years longer life expectancy for men reporting high physical activity and 1.6-1.8 years longer life expectancy for men reporting medium physical activity, compared with the sedentary group.13 14 We obtained estimates of similar magnitude. Total mortality was substantially influenced by the length of time since the change in physical activity took place. One recent study that used time dependent analysis to investigate change in physical activity in relation to mortality in men and women aged 19 to over 90 years found an association between change in physical activity and mortality in men under the age of 70.15 In that study, however, the direction of change, the age when the change in physical activity occurred, and the time that had elapsed since the change remained unclear. A change in physical activity in the lower activity range might reflect a change in sedentary behaviour rather than in actual physical activity. Recent research showed that sedentary behaviour and physical activity were independently associated with obesity.37 Future research should aim to separate these two effects. Within the first five years after the investigation at the age of 60 we observed an increased risk associated with increased physical activity compared with men with unchanged high activity. Given the small numbers of deaths we are reluctant to place a strong emphasis on this increased risk, especially as mortality was not higher than mortality in men who continued to be sedentary. Although there might not be a true increase in mortality soon after increased physical activity, there is nonetheless no immediate benefit. This has also been observed in a community based cluster randomised trial in older people in whom participation in an exercise programme had no effect on mortality during the two year follow-up.52 There was, however, a much larger than expected improvement in health related quality of life after the intervention, suggesting that increased activity might have early health benefits that are collectively too small to have an impact on total mortality. Our results could have important implications in the planning of clinical trials as these would need to be long enough to extend beyond the period of no benefit and to take into consideration the ethical implications of a possible increase in short term risk. Different follow-up times might also yield different results in observational studies. We could not identify any characteristics distinguishing those who died shortly after taking up physical activity. A healthy survivor effect cannot be excluded as survival until age 60 was necessary for this analysis. Further research should investigate whether and to what extent increased physical activity affects mortality in the period soon after the change. In addition, the effects in other age groups and in women need to be studied. Mechanisms and reasons for an active choice to change physical activity are not fully understood. In conclusion, we have shown a graded reduction in total mortality risk with increasing physical activity level in men. Increased physical activity in middle age increases longevity after an induction period of up to 10 years of no benefit. An increase in physical activity has the same impact on lowering mortality rate in the long term as smoking cessation. Thus, efforts for promotion of physical activity, even among middle aged and older men, are important. Contributors: LB and KM designed the study, analysed and interpreted the data, wrote the manuscript, and are guarantors. HM contributed to the study design, interpretation of the data, and writing of the manuscript. LGB provided statistical advice, analysed and interpreted the data, and commented on drafts of the manuscript. RG and AA interpreted the data and made significant contributions to drafts of the manuscript. JS, BZ, and AW provided clinical and methodological advice and commented on drafts of the manuscript. All authors declare that they accept full responsibility for the conduct of the study, had access to the data, and controlled the decision to publish. Funding: The study was funded by the Swedish Research Council. The funder had no role in the design and conduct of the study; the collection, management, analysis, and interpretation of data; the writing of the manuscript; or the decision to submit the manuscript for publication. Ethical approval: The study was approved by the ethics committee at the Faculty of Medicine, Uppsala University, Sweden, and all participants gave written informed consent. Bull FC, Armstrong TP, Dixon T, Ham S, Neiman A, Pratt M. Physical inactivity. In: Ezzati M, Lopez AD, Rodgers A, Murray CJL, eds. Comparative quantification of health risks. Global and regional burden of disease attributable to selected major risk factors. Geneva: World Health Organization, 2004:729-882. www.who.int/publications/cra/chapters/volume1/0729-0882.pdf. Boström G. Habits of life and health. Scand J Public Health2006;34:199-228. Farahmand BY, Ahlbom A, Ekblom Ö, Ekblom B, Hållmarker U, Aronson D, et al. Mortality amongst participants in Vasaloppet: a classical long-distance ski race in Sweden. J Intern Med2003;253:276-83. Lakka TA, Laaksonen DE. Physical activity in prevention and treatment of the metabolic syndrome. Appl Physiol Nutr Metab2007;32:76-88. Pate RR, Pratt M, Blair SN, Haskell WL, Macera CA, Bouchard C, et al. Physical activity and public health. A recommendation from the Centers for Disease Control and Prevention and the American College of Sports Medicine. JAMA1995;273:402-7. Haskell WL, Lee I-M, Pate RR, Powell KE, Blair SN, Franklin BA, et al. Physical activity and public health: updated recommendation for adults from the American College of Sports Medicine and the American Heart Association. Circulation2007;116:1081-93. Physical Activity Guidelines Advisory Committee. Physical activity guidelines advisory committee report. Washington, DC: US Department of Health and Human Services, 2008. www.health.gov/paguidelines/Report/Default.aspx. Leitzmann MF, Park Y, Blair A, Ballard-Barbash R, Mouw T, Hollenbeck AR, et al. Physical activity recommendations and decreased risk of mortality. Arch Intern Med2007;167:2453-60. Katzmarzyk PT, Janssen I, Ardern CI. Physical inactivity, excess adiposity and premature mortality. Obes Rev2003;4:257-90. Paffenbarger Jr RS, Hyde RT, Wing AL, Lee IM, Jung DL, Kampert JB. The association of changes in physical-activity level and other lifestyle characteristics with mortality among men. N Engl J Med1993;328:538-45. Wannamethee S, Shaper A, Walker M. Changes in physical activity, mortality, and incidence of coronary heart disease in older men. Lancet1998;351:1603-8. Schnohr P, Scharling H, Jensen JS. Changes in leisure-time physical activity and risk of death: an observational study of 7,000 men and women. Am J Epidemiol2003;158:639-44. Franco OH, de Laet C, Peeters A, Jonker J, Mackenbach J, Nusselder W. Effects of physical activity on life expectancy with cardiovascular disease. Arch Intern Med2005;165:2355-60. Jonker JT, De Laet C, Franco OH, Peeters A, Mackenbach J, Nusselder WJ. Physical activity and life expectancy with and without diabetes: life table analysis of the Framingham Heart Study. Diabetes Care2006;29:38-43. Talbot LA, Morrell CH, Fleg JL, Metter EJ. Changes in leisure time physical activity and risk of all-cause mortality in men and women: the Baltimore Longitudinal Study of Aging. Prev Med2007;45:169-76. Michaëlsson K, Olofsson H, Jensevik K, Larsson S, Mallmin H, Berglund L, et al. Leisure physical activity and the risk of fracture in men. PLoS Medicine2007;4:e199. Løchen M-L, Rasmussen K. The Tromsø study: physical fitness, self reported physical activity, and their relationship to other coronary risk factors. J Epidemiol Community Health1992;26:103-7. Rosengren A, Wilhelmsen L. Physical activity protects against coronary death and deaths from all causes in middle-aged men. Evidence from a 20-year follow-up of the primary prevention study in Göteborg. Ann Epidemiol1997;7:69-75. Collen MF, Cutler JL, Siegelaub AB, Cella RL. Reliability of a self-administered medical questionnaire. Arch Intern Med1969;123:664-81. Aires N, Selmer R, Thelle D. The validity of self-reported leisure time physical activity, and its relationship to serum cholesterol, blood pressure and body mass index. A population based study of 332,182 men and women aged 40-42 years. Eur J Epidemiol2003;18:479-85. Farahmand BY, Persson P-G, Michaëlsson K, Baron JA, Alberts A, Moradi T, et al. Physical activity and hip fracture: a population-based case-control study. Int J Epidemiol2000;29:308-14. Selzer ML. The Michigan alcoholism screening test: the quest for a new diagnostic instrument. Am J Psychiatry1971;127:1653-8. Andersen R, Smedby B, Anderson D. Medical care use in Sweden and the United States. A comparative analysis of systems and behaviour. Chicago: Center for Health Administration Studies, 1970. Calltorp J, Adami HO, Åström H, Fryklund L, Rössner S, Trolle Y, et al. Country profile: Sweden. Lancet1996;347:587-94. Rothman KJ. Modern epidemiology. Philadelphia: Lippincott Williams and Wilkins, 1998. Andersson T, Alfredsson L, Källberg H, Zdravkovic S, Ahlbom A. Calculating measures of biological interaction. Eur J Epidemiol2005;20:575-9. Li R, Chambless L. Test for additive interaction in proportional hazards models. Ann Epidemiol2007;17:227-36. Shephard RJ. Limits to the measurement of habitual physical activity by questionnaires. Br J Sports Med2003;37:197-206. Ferrari P, Friedenreich C, Matthews CE. The role of measurement error in estimating levels of physical activity. Am J Epidemiol2007;166:832-40. Saltin B, Grimby G. Physiological analysis of middle-aged and old former athletes. Comparison with still active athletes of the same ages. Circulation1968;38:1104-15. Hedman A, Byberg L, Reneland R, Lithell HO. Muscle morphology, self-reported physical activity and insulin resistance syndrome. Acta Physiol Scand2002;175:325-32. Sequeira MM, Rickenbach M, Wietlisbach V, Tullen B, Schutz Y. Physical activity assessment using a pedometer and its comparison with a questionnaire in a large population survey. Am J Epidemiol1995;142:989-99. Engels JM, Diehr P. Imputation of missing longitudinal data: a comparison of methods. J Clin Epidemiol2003;56:968-76. Erlichman J, Kerbey AL, James WPT. Physical activity and its impact on health outcomes. Paper 1: the impact of physical activity on cardiovascular disease and all-cause mortality: an historical perspective. Obes Rev2002;3:257-71. Gregg EW, Cauley JA, Stone K, Thompson TJ, Bauer DC, Cummings SR, et al. Relationship of changes in physical activity and mortality among older women. JAMA2003;289:2379-86. Andersen LB. Relative risk of mortality in the physically inactive is underestimated because of real changes in exposure level during follow-up. Am J Epidemiol2004;160:189-95. Hamilton MT, Hamilton DG, Zderic TW. Role of low energy expenditure and sitting in obesity, metabolic syndrome, type 2 diabetes, and cardiovascular disease. Diabetes2007;56:2655-67. Vartiainen E, Seppälä T, Lillsunde P, Puska P. Validation of self reported smoking by serum cotinine measurement in a community-based study. J Epidemiol Community Health2002;56:167-70. Kenfield SA, Stampfer MJ, Rosner BA, Colditz GA. Smoking and smoking cessation in relation to mortality in women. JAMA2008;299:2037-47. Gould AL, Davies GM, Alemao E, Yin DD, Cook JR. Cholesterol reduction yields clinical benefits: meta-analysis including recent trials. Clin Ther2007;29:778-94. Byberg L, Zethelius B, McKeigue PM, Lithell HO. Changes in physical activity are associated with changes in metabolic cardiovascular risk factors. Diabetologia2001;44:2134-9. Friedenreich CM, Orenstein MR. Physical activity and cancer prevention: etiologic evidence and biological mechanisms. J Nutr2002;132:3456-64S. Dishman RK, Berthoud HR, Booth FW, Cotman CW, Edgerton VR, Fleshner MR, et al. Neurobiology of exercise. Obesity2006;14:345-56. Kuh D, Bassey EJ, Butterworth S, Hardy R, Wadsworth MEJ, and the Musculoskeletal Study Team. Grip strength, postural control, and functional leg power in a representative cohort of British men and women: associations with physical activity, health status, and socioeconomic conditions. J Gerontol A Biol Sci Med Sci2005;60:224-31. Portegijs E, Rantanen T, Sipilä S, Laukkanen P, Heikkinen E. Physical activity compensates for increased mortality risk among older people with poor muscle strength. Scand J Med Sci Sports2006;17:473-9. Tessier S, Vuillemin A, Bertrais S, Boini S, Le Bihan E, Oppert JM, et al. Association between leisure-time physical activity and health-related quality of life changes over time. Prev Med2007;44:202-8. 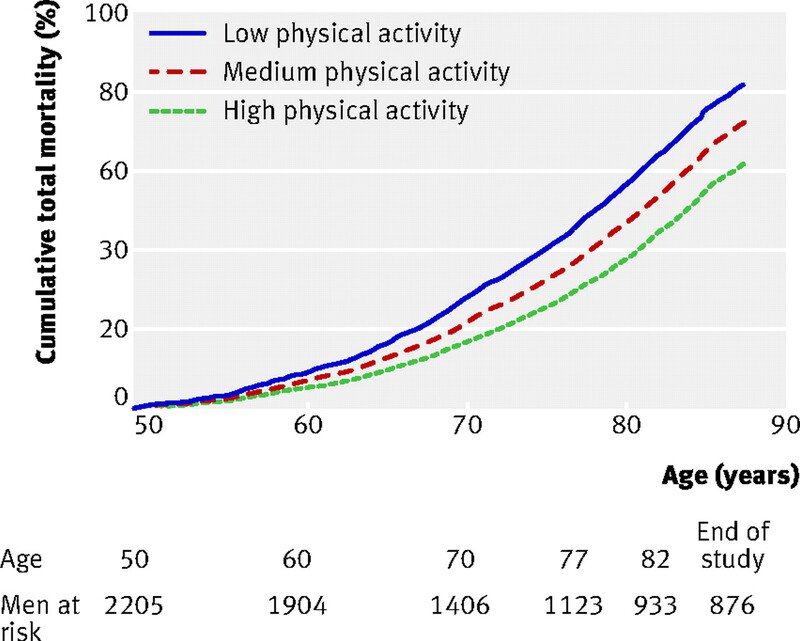 Rankinen T, Bouchard C. Invited commentary: physical activity, mortality, and genetics. Am J Epidemiol2007;166:260-2. Carlsson S, Andersson T, Lichtenstein P, Michaëlsson K, Ahlbom A. Physical activity and mortality: is the association explained by genetic selection? Am J Epidemiol2007;166:255-9. Cherkas LF, Hunkin JL, Kato BS, Richards JB, Gardner JP, Surdulescu GL, et al. The association between physical activity in leisure time and leukocyte telomere length. Arch Intern Med2008;168:154-8. Munro JF, Nicholl JP, Brazier JE, Davey R, Cochrane T. Cost effectiveness of a community based exercise programme in over 65 year olds: cluster randomised trial. J Epidemiol Community Health2004;58:1004-10.